Livestock cattle guards have been in use for decades and with good reason: They allow vehicles to conveniently cross a fence-line without the allowing a herd to wander off. Cattle guards provide effortless access to your pastures and provide the peace of mind that your animals remain safely contained, no matter who’s accessing the land. The inconvenience of opening and closing a gate cannot be overstated. Have you ever dreaded approaching a closed gate in a downpour or subzero temperatures knowing that you have to stop, get out and open the gate, get back in and drive through only to do it all over again to close the gate behind you? It’s especially annoying when you’re climbing down from a large piece of equipment or when your cows are present and curious to see what the open gate is all about when you’re driving through. These nerve-racking moments are over as soon as your cattle guard is installed. Simply pass over the cattle guard knowing that your livestock cannot follow and carry-on with your day. It’s not just you that’s inconvenienced with a gate and third-parties are not as diligent as owners when it comes to making sure it gets closed behind them. Every someone else needs access through your fence line, there is a risk of your cattle escaping. All it takes is for one person to forget to close or not properly secure a latch and your livestock could easily slip out. This is especially important in remote areas where an open gate can go unnoticed for an extended period of time. Typically, it’s someone not affiliated with your operation that leaves it open and with access granted to third parties such as oil and gas companies, cell phone tower operators or any other organization that needs access to your land, it is difficult to ensure the gate will always be properly closed in a timely manner. With the installation of a cattle guard, you can be sure that anyone can drive through your property and your animals will not be wandering off. This peace of mind (especially at night when you’re trying to fall asleep!) is a real lifesaver and you can rest assured that your neighbor or ranch-hand has not allowed your investment to roam freely into the dangers of an unconfined area. Although all may be considered for your operation, each type of design has it’s own advantages. Take a look at the round and flat top-pipe steel construction as well as the concrete design when planning your installation. The traditional design uses a round top-pipe to provide a strong, physical livestock barrier. It’s the most effective because a flat hoof is very difficult to balance on the rounded surface of the pipe. The combination of a large amount of weight balanced on a very small, unstable area creates a very strong negative feedback to the animal trying to cross. This physical deterrent is very effective even when tested by your most daring and curious cows. The physical discomfort and resulting avoidance reaction is made more pronounced when coupled with the visual barrier of looking through the gaps of the top pipes. Oftentimes just the confusion created by the visual cues of the perceived varying depth is enough to dissuade even walking across. In fact, some studies have shown that paint schemes on flat pavement designed to create the illusion of varying depths is often enough to prevent walking on, at least temporarily. The animals perceive that there is uneven ground and won’t bother investigating further. Round top-pipe cattle guards provide the most effective physical barrier needed to keep livestock contained and allow vehicles to cross without the inconvenience or risk of an open gate. 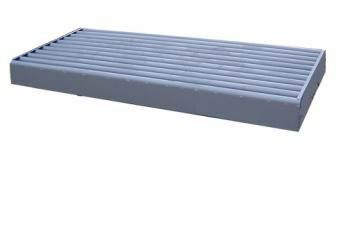 To provide a smoother crossing for automobiles, especially at higher speeds, a flat top-pipe cattle guard may be what you’re looking for. These cattle guards are typically for use in high traffic and high-speed vehicle crossings. The top pipe is flat and narrow so that it provides both the physical and visual barriers necessary for hoofed animals. Its physical deterrent is not as aggressive as the round pipe, but is still effective and provides a much smoother crossing for all vehicle types. These cattle guards are also available in higher load-carrying capacity ratings than the round pipe and are typically seen as more aesthetically pleasing for designers and homeowners. Another great option to the traditional steel guard is the use of concrete forms. These forms allow you to pour your own and make as many as you wish. Concrete cattle guards are used almost exclusively in rural areas that don’t see the high traffic areas of steel guards, but they do have a lot of advantages that steel can’t compete with. One of the best features of using forms is that you can make as many of them as you like. With detailed instructions, you can create a 16 ton per axle (HS20- rated) crossing for your heaviest vehicles! Your only cost is that of the concrete and the plastic forms themselves. If you have the ability to mix your own concrete, this can be an extremely economical option. Shipping costs are also substantially less than that of one-piece steel products. The forms usually ship as an over-sized package and aren’t required to go on a flatbed truck via the common carriers. The shipping cost savings can be substantial and are often an important consideration for the overall cost of your project. One word of caution with any concrete product exposed to the elements: Keep an eye out for cracking or crumbling. Concrete doesn’t always do well with high velocity impact and chipping or cracking can occur. Once started, a small chip can turn into a larger area of decay and cracks can allow water to penetrate the concrete which can then freeze and crack from within. A s long as you keep an eye out for external damage and patch it when necessary, concrete will last a very long time. Whichever route you choose, a cattle guard can provide years of rugged use and the convenience and security of never having to manage the opening and closing of a gate. It also provides the peace of mind knowing that your animals are held securely in their pasture! For more information or help with your installation, check out www.BarnWorld.com or give them a call at (720) 238-2190 and they’ll be happy to help. Cattle guards allow for ease of access to your pastures and livestock, or keep your valuable animals at home without the use of cumbersome gates. It’s not necessary to stop, get out of your vehicle or climb down from your farm equipment to open a gate, drive through, all the while watching for animals trying to escape along the way, only to then get out again to close the livestock gate behind you. Better make sure it’s secure behind you to prevent a jail break when you’re not around! The guards offer peace of mind knowing that a gate wasn’t left open and that you won’t have to spend your day chasing your cattle or other animals around the county!. That’s why Barn World offers not only a large selection of livestock supplies, but also a wide variety of cattle guards and options. Flat Pipe vs. Round Pipe – two different finishes for different uses. The flat piping offers vehicles a smoother ride when crossing the control area and is a valuable option to consider when higher speeds are present. Even through the flat topped guard isn’t as daunting to livestock as the round pipe, it still provides an effective deterrent. These are typically used on highways and high traffic areas where speeds and vehicle comfort are a priority. Round pipe offers the most effective means of dissuading animal crossings. A large part of the deterrent is a mental and visual cue that the animal perceives. A round piped guard creates a deeper shadow and the perception of a larger obstacle than the flat. It also offers a more challenging physical barrier. A flat hoofed animal with have a very difficult time finding footing on a rounded surface and won’t be able to balance its hoof on the pipe. We have seen cattle ‘test’ a guard by placing a single hoof on the pipe only to realize that it can’t place any weight on the hoof to cross. If the visual appearance doesn’t immediately persuade it to stay away, the inability to balance a single hoof on the cattle guard will. The round style is very popular on farms, ranches, private drives and public roadways. These boxed guards are extremely popular and useful for construction sites as washouts, dirt shakers and allow for installation without digging a vault and pouring footings. To clean debris out from underneath, it can simply be drug from it’s resting place and then returned again. It is important to install on level ground to prevent movement over time. Wings are used to connect the guard to a fence-line to prevent livestock from crossing around the fence post. They are triangles that attached to the ends of the barrier, lean away from the roadway and provide a vertical post to run the fencing to. Without them, crossing around the last fence post can be possible and some animals may just skirt the guard. It’s important to remember that these barriers are not effective for all types of animals and of particular note, we don’t not recommend them for horses. Horses hooves and legs are such that they can slide their leg down between the pipes. They then panic in an effort to get out and can break their slender leg. We suggest a gate be used with at all times to contain horses. Other animals that may not be discourage and can simply walk across the tops or rounded pipe are goats, dogs & cats, sheep and hogs. They are more sure-footed and can trot right across a cattle guard. For information or help with your cattle guard project, whether it’s for private use, construction, public roadways or heavy duty off-road use, please contact Barn World and we will be happy to help plan your project with you. As always, please go to www.BarnWorld.com or call 720.238.2190 for all of your livestock supply needs!